Let me start this post by saying that I have always had trouble with making rice that is mixed with anything. I have always found that making khoresht with white rice is the easiest thing for me to do. I have made mixed rice a number of times but what I have always found difficult is finding the right balance between the rice and the other ingredients. Here comes the truth, I have had some serious disasters with mixed rice. The very first time that I made Lubia Polow, rice with green beans, it was a pathetic, pathetic sight. Here is the thing though, I am stubborn and I have not been known to back down a challenge. So I keep trying until practice makes perfect, at the expense of my wonderful and supporting husband! A couple of weeks ago I craved Baghali Polow and decided that it was time to roll up my sleeves and give it my best try. Additionally, I had also realized that in my repertoire of posted recipes, I had not yet graced my readers with a Polow. I am such a giver ain’t I?? You ask what is Polow? Persians refer to rice that is mixed with other ingredients as Polow. White rice is simply refered to as Chelow. So I consulted three cookbooks for ratios for this recipe. I also decided to go all out and make lamb shank to go with it. All was good until the end. I ended up under cooking the tahdig, and and and wait for this, the rice was not flavorful enough, in my opinion. But the lamb shank was fabulous! I will post that recipe next. I felt somewhat defeated about the polow and figured that I would have to practice some more. Then we flew out to Seattle and the night that we got there we wanted to cook dinner for our friend Winford and his roommate/landlord Dirk as they were hosting us at their house. We were walking through Pike Place Market trying to figure out what to make after we took a fun guided tour of the market. Winford suggested making something different that would “wow” Dirk. He soon declared that we should make Persian food. Who am I to turn down “wowing” someone with Persian food??? After all I am the one who has a blog solely dedicated to Perisan food. We did some brain storming and I was persuaded into making Baghali Polow. My resistance to the idea went to deaf ears. I started sweating at the idea that this was going to be too much pressure. It had been a long day already. I was surviving completely on coffee as we had left our house at 5:30am to catch our plane to Seattle. I was forced to go to Starbucks to get coffee in the morning because there was nothing else in the terminal close to gate and when I came to pour the half and half the whole lid of the flask just fell into my coffee splashing all over my pretty green linen shirt and the counter. As that was not enough once we landed in Seattle I came to use my phone and it didn’t work. Fortunately, The Sous Chef’s phone worked so we called our friend to tell him we had landed. But I ended spending 45 minutes on the phone with Verizon until they got my phone working out of state. It is a good thing that we have a national plan…yeah. So did I really want to end the day by making a fool out of myself and my cooking skills? Hell NO! We went shopping and bought all the necessary ingredients including the spices necessary to make Advieh along with some delicious sounding tea mixes for me! I went to work once we got home. AND ladies and gentleman, I DID IT! I decided to do a couple of things differently and the results were awesome. I lost count of how many times Winford went back for more. And the best part of it all, he asked for the recipe. Score! So here it is, this one is for you Winford! The first thing to do for this recipe is prepare the rice the same way you would for white rice or chelow. Once you have placed the rice in a strainer stop and pick up from here. Here is my added step that made a huge difference. The first time around I didn’t saute the fava beans, I just added them to the rice. SO, saute fava beans and garlic in some oil for about 5-6 minutes. Season with salt and pepper. Add enough water to cover the bottom of the pot. This should be a thin layer. Add 3 tbsp of Canola Oil. Give it a shaking so that water and oil mix a little. Then add a very generous layer of dill. Every recipe that you will read, will tell you to just layer. My grandma always used to mix the rice and ingredients a little bit. Very gently with a spoon mix the rice, fava beans, and dill. Continue layering until you are out of both rice and the rest of the ingredients. As a bonus here are two pictures of our first dinner in Seattle. Instead of using yogurt the boys requested potatoes as part of the tahdig. This is rather easy to make. Instead of using yogurt and saffron you can layer the bottom of the pot with potatoes. All you have to do is go ahead and place water and oil to the bottom of the pan, I added 2 extra tbsp of oil because of the potatoes. Layer the top with rice making sure that you fill up the gaps between the potatoes with rice. Continue layering as shown above. The cooking process remains the same. If your tagdig doesn’t come out easily, just fill up your sink with a couple of inches of water and place the pot in there for a couple of minutes. Then try again. It should come out tout suite! We had ourselves a fabulous evening eating al fresco. Here are the boys setting up our dinner table. The Sous Chef was busy de-boning the fish in this picture. Which reminds me, we bought some fish from Pike Place Market to have with our Baghali Polow. 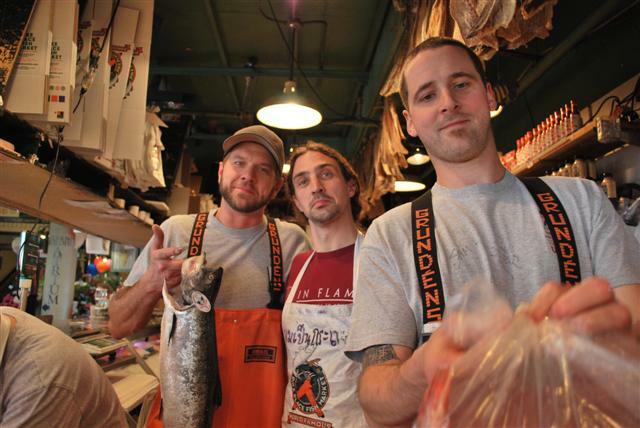 Now look at them studs below: the fine men who work at the fish market at Pike Place Market. Have you seen this month’s (June 2009) Sunset Magazine? There is a picture of the hottie on the left in there. And I, little nobody that I am, got to go behind the counter and take a picture with all three of them!!! Good Times! More on the fish that we made and ate will be shared in another post along with more pictures of the hot fishermen. 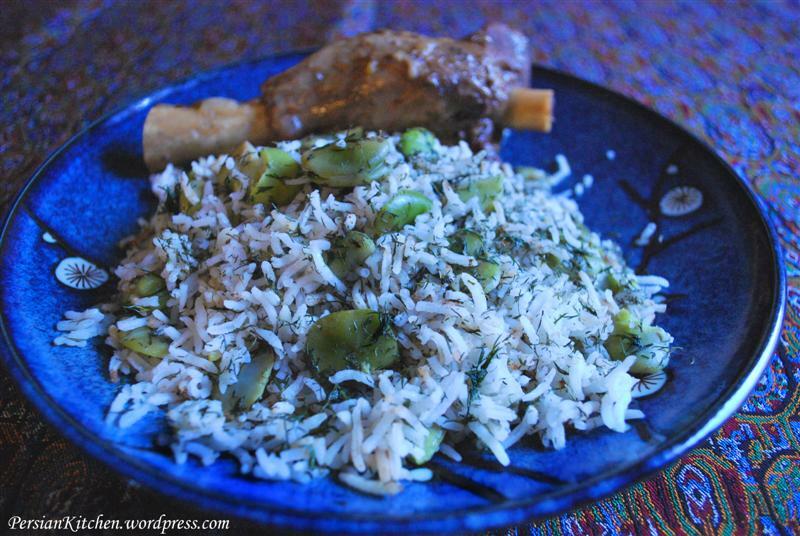 As a last note, I would like to add that generally the rice dish that accompanies fish in Persian food is Sabzi Polow, Herbed Rice. But I personally, think that Baghali Polow is also a nice complement to fish. Enjoy!!!! This dish can qualify as a vegan dish by omitting yogurt and butter and subsituting with canola or vegetable oil. I am totally inspired by your story. My attempts at Persian cooking have been a failure. But I am going to try anew! totally agree with you on practice makes perfect part.. love the idea of using rice with fava bean. yumm!! btw nice shots and love the presentation.. Thank you Nora. I think that the marriage between fava (or lima beans) and dill is a delicious one. They go well together. Growing up this was not a favorite dish, but I have come to love it more and more as an adult. The shots, yeah! It is crazy trying to cook and take pictures. I end up taking about 100 pictures for every recipe that I make and only use about 10 or so for the posts. It is well worth the effort though. Aww Maryam, you just made my day! I can’t tell you how many times I have failed. But one thing I have learned is that failure makes you want to succeed ten times more. Keep trying and let me know about the results! I love persian food and cook it regularly..I lived and worked in Tehran for some years. Can remember eating a dish called” albulopoolu” no idea how it is spelt! !Rice with sour black cherries/ Rice pink and fragrant..anybody have a recipe? I love albaloo polow and I am planning on making it and posting about it. I just found out that I missed a window of opportunity to go and buy fresh ones at a local orchard. But the recipe will appear on here soon! I found at http://mypersiankitchen.com/?p=875 a wonderful picture of Albaloo Polow ~ Persian Rice with Sour Cherries. Spelling correctly has always been a challenge for me …… let alone to attempt to spell correctly in a 2nd language. Polow came out nicely, thank you for sharing! Looking forward to learn more about persian cooking. My husband practically cried when he came home to this rice. He just loves polow and for some reason his mom had never made him rice with fava beans! My baby also love the fried up beans. It was so delicious with fresh dill. I’m so lucky to have a store close by that has so many fresh local herbs. Thanks again for a great recipe! Heidi, your husband is one hell of a lucky man!!!! I am sure he loves you that much more now that you have been making all these Persian dishes for him!!! Thank you for the pic’s while cooking. My wife is Persian and I fell in love with her even more when she/family introduced me to Persian food. Now lets just say that I’m the cook for the family so this really helps. I’ve been craving her side of the family’s food since we moved a couple states away. Finding your website is one of the best things that happened this new year!!. I like your twist to the recipe’s as I’ve watched my Mother in law make the same things yet could never remember everything she showed me. lol Thanks again. John, thank you for your kind words!! I am very happy to be of help!! Persian food does rock!! I love your website and Ive decided to start cooking Persian food, my first time making Persian rice, and I love Bagali Polow but I don’t have fresh dill, can dried dill substitute or should I just make saffron rice? Leila, absolutely, you can use dried dill. Just use 1/4 the amount of fresh. Ahh! I think I can follow this recipe! I haven’t had this dish since I was a little kid. My mom was friends with a couple from Iran, and we’d go to their house for dinner sometimes, and the woman ALWAYS made baghali polow. (Being so young, I thought it was called “bakopolo”!) My favorite was the crusty part on the bottom. YUM. I’m so excited to try it… it really must have been 20 years or so since I last ate it!